I wrote this the other day and it disappeared into wherever it is these things go. I’ve been doing a lot of walking for fitness. Usually I would walk as active rest, but now I’ve been walking as a real part of my fitness…and a good way to listen to recorded conference calls. Now that it isn’t as hot out, I love getting outside and walking around. Especially in our little neighborhood where I can say hello to people. We’ve been here over 3 years and don’t know a lot of our neighbors yet. I wish that our dogs could handle a walk more than around the block. There are a lot of great things about having older dogs. They are calm but have bouts of playfulness and are excellent couch mates. I love a good nap with these two. But they can’t take the long walks. Our boxer sometimes has a lot of energy, but then spends it really quickly. It is hard to know how far she can make it and also make it back. 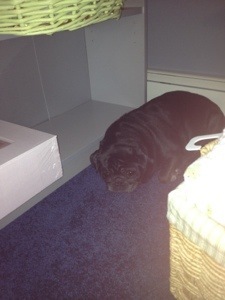 The pug is short and stocky and needs the exercise, but gets tired really quickly. I still take him for short walks, but when I’m walking for me he can’t make it. We have also started walking to more local places. Most of what is nearby is pizza, coffee and Red Mango so we don’t have much to choose from (except that there are four pizza places) but it’s a nice way to get out. We’ve only done pizza twice, so don’t think I’m living off of it or anything! I really appreciate that my husband will take these walks with me. He is training for a half marathon and is running most days and then walking with me. And I need to go so slow! A lot slower than my usual speed at least. Walking, especially with a buddy, is one of the only forms of exercise that seems possible after work, so it’s great for those days I don’t sleep well and choose more sleep over the gym (more and more frequent). I’m looking forward to walking with the baby once she’s here. And hoping it doesn’t snow a ton this winter so that it is actually possible! Babies may not actually require a lot of stuff, but there is a lot available for them! As more baby stuff comes into the house a lot of it looks so fun for a tiny human that we just can’t wait to test it out. 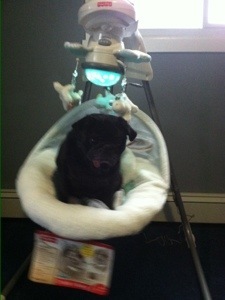 Pugs are about baby size, aren’t they? Sorry for the blurry pic, but video is better anyway, right? I’ll be back with more including my workout updates. 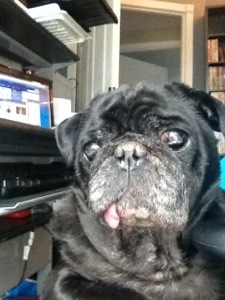 For now, just the pug. We are done with childbirth class! Our class was through the hospital and it was just a regular class (no special methods), went for three weeks for two hours a class. The last class was yesterday. I enjoyed it and learned a lot, but the class ended past my bedtime! Monday’s class was mostly two videos of births. Not as graphic as I expected. I know that I say it’s past my bedtime often. I feel like I’m always up too late. I have been trying to be in bed by 9, especially now that I wake up so frequently during the night. My alarm is set for 5am, so 9 isn’t crazy early. Usually I am up until about 10 but in bed reading or otherwise relaxing. 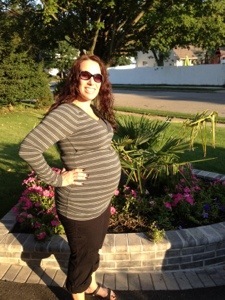 Hard to believe that I’m due only 6 weeks from now! We ordered the rest of the baby furniture along with a bunch of other stuff last night. We can’t wait to get that in the room so we can get it all situated and put up the wall art. We ordered four prints from jameshance.com and I want to get them on the walls! Seriously the cutest geek prints we’ve ever seen. Lots to still get ready, and I’m still waiting for a nesting instinct. I am currently assuming that it will be like the second trimester burst of energy…mythical but not happening for me! I keep getting bigger, but I can still fit a pug on my lap! He usually tries to work with me from around 3:30 until my husband gets home from work. Then he freaks because it is almost dinner time…Artoo’s favorite time of the day! 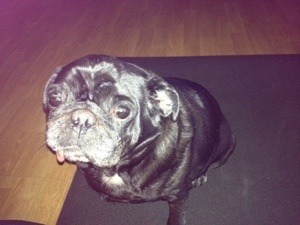 This is my pug, trying to workout with me. I did Yoga Booty Ballet – Baby on the Way this morning and until my husband got home he was right there with me. For this picture, I was in a cross-legged position (you can barely see my knee in the left corner). After this was some work in a hands and knees position, with eventually raising one leg. He got under my leg and basically held it up. I wish I had a way to get that in a picture! After the morning workouts, we went to our old local bar to watch football. I realize I am pregnant, but I do go to bars. I don’t drink in them, other than water (oh, and today some Sprite). I do eat in them. There is no smoking allowed, so I’m not sure what the difference is between a bar and a restaurant. Some people look at me strange especially now that I look unmistakably pregnant. I’m just there to hang with friends and I’m a convenient designated driver. It is a lot easier to go to these further away places on a Sunday when we aren’t choosing public transportation! I had a great time, good food, and more water than I can think of! And came home with time to food shop (ugh) and do some catch up on the internet. Not a bad Sunday. It is past my bedtime though. I need to fold laundry and call it quits on another weekend. 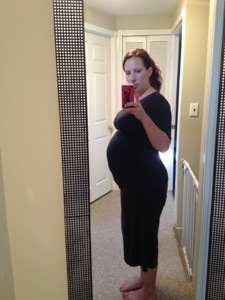 First of all, I found a review of my favorite maternity workout wear here. I agree with just about all of it! My food aversions are really starting to get to me. I never know what I want to eat, though I’m often hungry. I go to the food store and nothing looks remotely appetizing. The food store was never my favorite place, but now it is such a daunting experience. I come home with little to show for it. So then I have to go back again. Lather, rinse, repeat. I have had a fairly easy pregnancy, and this is only a minor inconvenience so I feel very lucky. Unfortunately, a lot of food I have bought has gone bad. I hate wasting food! But forcing myself to eat it just grosses me out. I definitely didn’t expect eating to be as much of an event through pregnancy. I expected a lot of “eating for two ” comments and people expecting me to eat everything and skip working out. I love that I’m still able to workout. It gives me sanity. It makes me happy. I’m sure it does so much more for me. I wish it could make me like more foods though! I wanted to make and freeze a bunch of food for after the baby comes but the thought of smelling all that food and possibly not wanting it later (though everyone says I’ll go back to my old likes and dislikes) just doesn’t seem appealing. Please don’t ask me what I want for dinner! Excuse the pajama-ness of my outfit. I work from home most days so I work out, shower and put on more comfy clothes. It definitely saves me time! I change if I leave the house, but with two dogs I usually have to wear an outfit at home and a new one when I leave. I’m a dog hair magnet! I was able to get back to working out and am feeling better. Today I did my favorite Turbo Fire workout (Fire 45) and had lots of fun! I am so glad I can still do Turbo workouts. My kicks are lower, my jumps are nonexistent and I modify a lot but it is still a good time. I have a smile on throughout the 45 minutes. My plan for the weekend includes some more Turbo Sunday. If you haven’t tried Turbo Jam or Turbo Fire I can’t recommend them enough! Everyone has a soul mate workout and they are definitely mine! My post-baby plan starts with Turbo Fire. I haven’t been feeling well for a few days. I guess it is to be expected during pregnancy, but I still am itching to workout! Most of my workout time has been spent sleeping which is good. I hope to be back on my game tomorrow. 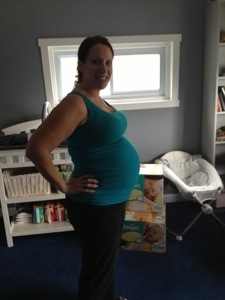 I have mentioned before that I was training for a half marathon when I found out I was pregnant. I had never run more than 4 miles when I started training, but I knew I could do it with the right plan. I used SmartCoach from Runner’s World to create my plan and had made it to 7 miles. I looked at other plans, but I liked that this could be customized. You enter a recent race length and time (or a recent run if you have no race to go by), the distance and date you’re training for, intensity level, how many miles you currently run per week, and the day to do your long run. I loved that I could set all of these and get something that would work for me without scaring me! The schedule shows the run and pace for each running day and then includes rest or cross training days. I was running 3 days, lifting 2, and doing 2-5 days of hot yoga. It was a lot, which is why the yoga days varied so much. I would see how I felt and always prioritize the running and lifting over the yoga. I’m not sure if I have the desire to train for a half marathon again, but I would like to do a 10K at some point. I don’t love running, but I enjoyed training with my husband toward a goal! I ran a 5K back in June when I was about 17 weeks pregnant. I did it faster than expected too! I posted last week about reasons to workout when pregnant and I touched on some of the benefits I think I have noticed. But I didn’t give reasons for why I make it such a priority and talk about it so much. I have been exercising for years. It is my stress release, my fun and has become an easy way to add to my health. I wont lie and say it was always easy, but over time it has gone from something I should do to something I do to help my weight loss to something I do because I enjoy it. Now I relate it to showering as something I know I’ll just do and it is a lot easier to find where it will fit in my schedule! How often do you just not shower because you don’t have time? Never? You make time. So when I found out that I was pregnant, I didn’t question if I wanted to continue to workout. From taking the group fitness instructor certification exam, I had learned a lot about modifications for pregnancy and I can also pull from the experiences of my friends. I knew what was presented as the benefits and they sound like great reasons. Mostly, having that information added to my own reasons. I still exercise for my stress release. I still find it fun, at least the workouts I do! And now it is an easy way to add to not just my health, but my baby’s also. I still used “easy” there, and while it hasn’t been difficult, it has been more of a challenge. I now need to exercise in the morning. If I wait until later in the day, I usually end up not working out or getting in something lighter than planned. Sometimes though, I have to choose sleep over exercise. Some days I don’t make it through my planned workout. It is much more important to listen to cues that I just don’t have it that day when there is a teeny human depending on me listening also. The same workouts are more difficult, and it is sometimes tough to find variety in the workouts I like. It is so worth the extra difficulty though! I can’t imagine my pregnancy without the exercise. I mentioned my streak on My Fitness Pal (MFP) the other day. I thought I should talk a little more about the website/app, especially as their latest app update has fixed my major issue with using the app instead of the website. I started tracking my food on MFP in April of 2011. At that point, I had been writing my food on paper, eating clean about 90% of the time. But I knew deep down that I needed more structure. Eating clean can be easy, and many people do well with it alone. But I like food in volume. I needed better portion control! So when I got home from a cruise, I started tracking online. Like anything new, it takes a while to get used to. But MFP has such a huge database that it was fairly easy. And I love being able to scan my food with the app. You can also copy meals from that meal time for any previous day that week, which is super helpful if you eat the same thing most days. They show a list of your most added foods and your recently added foods on the website to make it easy to find these. On the app, you used to only be able to see recent foods from that meal time but the new update lets you also look at all recent foods. I was able to add and rename meal times also. They start you with four (I think) but I have six (titled meals 1-6, but this can be changed also). I like that better than looking at everything I ate from 4 or 5am to noon in one “meal”! Making a recipe is easy to do, as is seeing the breakdown of your day by different categories. There are the usual calories, fat, protein, carbs and sodium but it will also show others and you can adjust the breakdown you want to aim for if you’d like. There is also an exercise feature, which logs your workouts and adjusts your calories for the day accordingly. One issue I have is that adding any workouts in their “strength training” section does not change your calorie goal. I know not everyone is like this, but if I’m going to lift heavy, I need to adjust. I enter all workouts under the “cardiovascular” section. Each day, when you complete your food diary, they tell you that if every day were like that day, you would weigh X lbs in Y weeks. Pretty nifty! I’ve continued logging my food during pregnancy because I know myself and I would go overboard without some accountability. I don’t always stay within their calorie goal (I changed it from wanting to lose weight to maintenance), but I know that the act of writing it down…even virtually…is better than not. Most days I’m under slightly. And to finish it out, a picture to mark 32 weeks (yesterday). This was on our way to Breastfeeding class.